"This recipe was given to me a while back and it is great on Sunday mornings. My boys just love it!" In a large bowl, combine the sugar, flour, cinnamon walnuts, apples, and cheese. Add the eggs, melted butter or margarine, and milk; stir until well blended. Pour into prepared loaf pan. Bake in preheated oven for 1 hour, or until done. If loaf starts to brown too much, cover with foil. A feather-light soufflé with caramelized apples and sharp Cheddar. This bread is delicious! The only suggestion I have is that if you like your bread cheesy, add more cheddar because as is, the bread only has a mild cheddar flavor. Good, but not to be eaten plain (needs butter). Foe one cup self-rising flower substitute one cup all-purpose plus 1/4 teaspoon baking powder and a "pinch" of salt. I have used this recipe many times for family and friends and everyone loved it! They've even asked for the recipe. This is good. It doesn't really have that much of an apple flavor though, which I think may have been better. Maybe could use more apple. 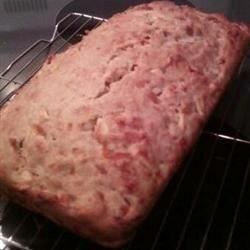 This is a very tasty quickbread! I would only use half the nuts as they were a bit overpowering. I also recommend using a sharp cheddar to bring out all of the flavors. I have never really gotten accustomed to apple/cheese combinations, but this bread was still pretty good. Definitely an interesting combination! yum! I didn't know what to wxpet when baking this bread, but the final results were yummy. THe bread is a little dry, so next time I think I'll beef up the liquid just a bit.